Hosted by the Shenandoah and Upper James River Chapters. 5–6 p.m. Registration and social hour. Cash bar. Reserved rooms for VNPS are available at the Best Western Staunton Inn, 90 Rowe Road, just off of U.S. 250 East at the I-81 Exit for Staunton and Waynesboro (a half mile from the entrance to the Frontier Culture Museum). The special Annual Meeting rate applies only for Friday, Sept. 11, and Saturday, Sept. 12. The rate is $93 (tax included) per room per night. Reserve by August 29; 32 nonsmoking rooms with two double beds and three nonsmoking rooms with one king bed have been reserved. For reservations, call 1-800-752-9471 and mention the Virginia Native Plant Society. There are several other hotels nearby. Your registration packet will include information about local points of interest and restaurants. I-81 Exit 222. Head west on U.S. 250. The Frontier Culture Museum is a half mile on the left. Proceed to the visitor parking lot. On Saturday and Sunday, park in the visitor parking lot. Walk down the main sidewalk to the Pavilion on your left. On Friday, continue through the parking lot and turn to the left of the flag poles. Follow the sign to the Dairy Barn parking area. 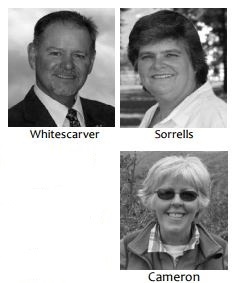 Three speakers with years of experience in the Shenandoah Valley’s natural world will present programs at the Annual Meeting. On Friday evening, Lynn Cameron, co-chair of Friends of Shenandoah Mountain and long-time board member of numerous outdoor organizations, will explain why Shenandoah Mountain is a special place in the national forest and deserves permanent protection. A retired librarian, Cameron spends most of her time building support for the proposed 90,000-acre Shenandoah Mountain National Scenic Area. Following Cameron will be Nancy Sorrells, Sempervirens Editor for almost 20 years, who recently spent many months working to ensure that fracking would be banned from the George Washington National Forest. Even before that matter was settled, the proposed Atlantic Coast Pipeline became an issue in the mountains and valleys of western Virginia. She will talk about some of the habitats that could be affected by this natural gas pipeline project. As the keynote speaker Saturday night, retired USDA District Conservationist Bobby Whitescarver will spin some true tales of planting native trees and restoring prairie in a sea of invasives and ignorance. Be prepared to sit back and enjoy his light-hearted humor that will include stories about the apple pie that restored a watershed, a “plantapillar,” the gag order on fescue, and the connection between toilet paper and prescribed burns. The Virginia Native Plant Society has awarded its first two Research Grants to the Virginia Master Naturalist Program and the Ted R. Bradley Herbarium at George Mason University. Each will receive $5,000 for work important to the promotion of native plants and botany in Virginia. The research will be done over the summer, and progress will be reported at the VNPS Annual Meeting. Under the grant, they will develop a citizen science program in collaboration with the Virginia Natural Heritage Program for monitoring the distribution of and threats to rare and threatened plant populations in the state. With citizen scientists, they will focus on identifying the primary threats to 30 species. Andrea Weeks, associate professor of biology and director of the Ted R. Bradley Herbarium at George Mason University, received a grant for her proposed project, titled “Virginia’s Virtual Herbarium: Liberating Big Data for Our Native Plants.” Her grant will supplement funding from the National Science Foundation supporting high-throughput digital imaging of specimens from 11 Virginia herbaria and the transcription of information about each specimen by citizen scientists. The initiative will create a public, online herbarium of nearly 300,000 Virginia specimens of vascular plants. The VNPS Research Grant Program was begun after the Society received a generous bequest from longtime member Marjorie A. Pitts, who had belonged to the Potowmack Chapter. It was launched with a call for proposals last winter. The stated goals were to encourage the study of native plant biology and ecosystems and to advance botany education. This first year of the program was envisioned as a pilot that included assessment of interest among researchers and the evaluation of related procedures. The Virginia Academy of Science provided technical advice, and seven volunteers stepped forward to form a selection committee, including academics and amateur native plant experts. The pilot was an overwhelming success. The committee reviewed 18 student and faculty applications, including at least one from every major college or university in the commonwealth and several from conservation organizations. —Cathy Mayes, Treasurer Mayes, grants administrator, chaired the committee that established the grant program. Joyce Wenger chaired the selection committee. Thanks to the selection committee and the scientists who took the time to prepare applications for grants. The benefits of their work will be seen as the program develops. Review the following field trip options, and be ready to make your selections for first and second choices on the Registration form – see the button at right to begin your registration. Saturday, Sept. 12 FULL-DAY TRIPS, DEPART 9 A.M., RETURN BY 4:30 P.M.
2. ___ Rockbridge County. Explore three habitats in the James River watershed. Stop 1: Brushy Hills. Moderate. Originally protected as a source for Lexington’s water, Brushy Hills’ 560 acres are being reclaimed for recreation and education. We will check management sites as we explore for September blooms and seed pods. 2 hours. Stop 2: Boxerwood Nature Center and Woodland Garden. Easy. Once a plant collector’s private garden, Boxerwood is evolving to nonprofit status as a public nature center, providing environmental education for all ages. 2 hours. Stop 3: Chessie Trail. As a riverine habitat along the Maury River, the trail has been a canal boat towpath and a railroad bed. We will see protection methods for identified native plant areas and invasive nonnative plant management as we explore a path framed by the geology of a mountain river gorge. 2 hours. Group limit, 15. 7. ___ American Chestnut Foundaton trip to Lesesne State Forest in Nelson County. Learn to identify American, Chinese, European, amd Japanese chestnuts and Chinquapins. The foundation’s breeding program will be described. If time permits, visit a site off the Blue Ridge Parkway to harvest Chinese and American or backcross (hybrid) nuts. Leader, Jack LaMonica. Group limit, 12. 9. ___ Historical tour of Staunton and Lewis Creek watershed. Hilly; walk about 1.5 mi. on downtown sidewalks with steps and hills to explore Staunton’s Lewis Creek and follow the water’s flow while listening to related stories. Topics: A little map study for orientation; Karst topography and local geology; Lewis Creek’s historic importance and its “disappearance/reappearance” in Staunton; how the creek became an “impaired waterway”; and Staunton’s municipal projects for improving the water quality of the creek. Leader, Betty Gatewood. Group limit, 12. Saturday, Sept. 12, Afternoon HALF-DAY TRIPS; DEPART 1 P.M., RETURN BY 4:30 P.M.
11. __ Tilghman Road in the George Washington Natonal Forest. Asters and Monkshood (Aconitum uncinatum) are among the many visual possibilities on this stretch of Forest Service road. We will be looking for birds and mushrooms as well. Leader, Diane Holsinger. Group limit, 12. 12. __ Augusta Springs Wetlands. After a 25-min. drive west from Staunton, take the handicapped-accessible 2/3-mile boardwalk loop around the wetland and explore the natural history of this special area. It is home to Wood Ducks, Beaver, Pickerel Frogs, Tiger and Spicebush Swallowtail butterflies, and Green Herons. It was the site of a hotel and resort springs from the late 1800s, now long gone. Picnic tables are available under the shade of 100-plus-year-old maples. Many wetland natives, and an excellent birding spot. Leader, Mike Smith. Group limit, 15. Sunday, Sept. 13, MORNING HALF-DAY TRIPS; DEPART 9 A.M. Questions about registration or any details about the event? Please contact Karen York at 540-837-1600.